------T'To appreciate today, understand the past'. Such words are often spoken by historians, and they are certainly true. Geology is the historical science. Every rock tells a tale of the past. And, together with a landscape of rocks, that tale is more fantastic than fiction. 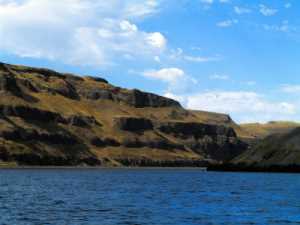 ------The tale here, in the US along the Snake and lower Columbia River, is a saga with three main chapters: collision, fire and ice. It is a rather straight forward story if one doesn't "bother with the details." ------Roll back your geologic time machine to 150 million years ago and stand about where Kettle Falls, on Lake Roosevelt in Northeastern Washington, is today. You are on a sandy beach, with ocean waves crashing nearby. It is the margin of the continent. Giant reptiles are prowling about looking for you, a tidbit of fresh meat. Looking offshore, miles beyond the breakers, you spy a huge island, about the size of California, studded with smouldering volcanoes and also stalked by dinosaurs. Continental drift is slowly sliding the island eastward. You push the fast forward button just as a munch-a-saur scents your warm blood. ------Now, with a freeze-frame about 70 million years ago, you spy around you the scattered bones of recently deceased dinosaurs. Earth is emerging from a long cold spell caused by shrouds of dust in the atmosphere - the result of an astrobleme impact somewhere near the Yucatan. You are no longer on the western margin of our continent. That offshore island was shoved into the continent, clobbering the rocks of both the island and continent. The head-on collision folded, twisted, and generally smashed the impact zone. The powerful forces baked and altered the rocks into a newly recrystallized mess of metamorphic (meta = change; morph = form) rocks - things we call schist, gneiss, and slate. To make matters worse, the force of the collision caused molten rocks to intrude into the mess, infusing granite into the metamorphics. ------The next chapter of the tale involves fire. You use that time machine again, but this time to go back about only seventeen million years - just a few clicks backward in the long saga of Earth history. The scene is incredible. Near the Idaho/Oregon/Washington border, deep cracks have rifted open. Massive fountains of fluid lava leap hundreds of feet skyward from the fissures, brightening the night sky with a red glow that can be seen hundreds of miles away. Fluid lavas roar out of the fissures, and flow in sheets across the landscape blanketing a vast area of central Oregon, Idaho, and Washington with black layers of basalt, still glowing red beneath their thin cooling crusts. Almost everything is buried under lava - every coulee, every wash, every valley was an avenue for the fluid lavas, and eventually they too filled with the congealing basalt. What had been a landscape of hills and valleys has become a flat, hot, smoking, featureless volcanic plateau, with only a few remnant 'steptoe' hilltops above the plain. ----- Then quiet. The lavas hardened to rock. Weather broke down the lava into rich soil, fresh with new mineral plant food. Lichens, moss, and ferns grew. Rains and floods wore down new creek valleys, and grasses colonized the stream banks. A great river, ancestor to the Columbia, ploughed a new course through and around the lava landscape. Eventually forests grew, and giant mammals roamed and grazed the verdant landscape. Climate then was much warmer than today - perhaps even tropical, so the region was Amazonian, not Columbian. For tens of thousands of years, the region was a verdant tropical rainforest. ------This peaceful scene suddenly was destroyed. Lavas again fountained up from new fissures, and again, flow after flow of fluid red-hot lava inundated and consumed everything living in its path. Forests burned, animals fled or died, the newly-formed valleys were again filled with molten rock and in an eyeblick of geologic time, all was transformed again to a hot, smoking plain of black lava. Buried beneath the lavas were residuals of soil and and lake sediments, some with wood fragments from the forests, opalized and silicified. A petrified forest of Ginkos is preserved at a State Park, fossil witness to these events. Petrified wood is Washington's state gem. ------There were no human witnesses to this incredible history, but rocks have lithic memories. Trapped in the 'frozen' lavas are radioactive clocks, elements that slowly and regularly change their nature through time. Precise measurements of the clocks tell the date when each of the lavas froze. These clocks leave a trail for geologists to pursue into the past. They say the first eruptions of lavas poured over the landscape 17.5 million years ago, and that the greatest volume of lava was erupted before 15.5 million years ago. Carefully measuring the clocks in the stack of lavas, geologists discovered that this scene was repeated hundreds, perhaps thousands of times. ------Imagine a landscape so inundated by lava flows, so many times, that their accumulated thickness exceeds two miles! This pile of rock is so heavy that the crust sank under the weight. 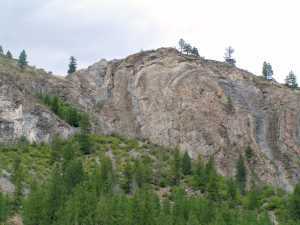 A huge bowl-shaped depression, the Columbia Basin, was formed. The Basin comprises a third of the state of Washington - 63,000 square miles of depressed rock. 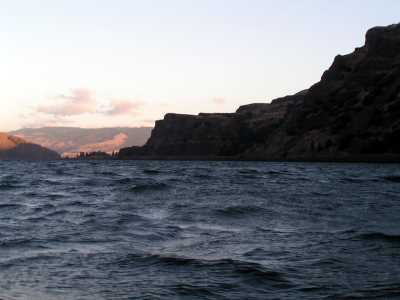 ------The Columbia River's ancestor is older than the lavas. The Rockies were uplifted, to the east, tens of millions of years before the lava episode in the Northwest. Rainfall on those lofty ranges fed rivers that carried water across the Northwest to the sea. The ancient Columbia was one of those rivers. Then began the period of fire. The erupting lavas often poured down the declivity of the river valley. As clouds of steam roared skyward, the flow of water diverted from the cooling solid mass of basalt. After each episode, the mighty river carved a new canyon - a new gorge - through the resisting basalts. Many times, the river shifted northerly away from the lava plain, cutting anew through less resistant rock. Some of the lava flows poured all the way down the ancestral Columbia's valley to the sea. Imagine the scene - a valley filled to the brim with lava, with gases and smoke emerging from the pile of baking vegetation below. At the sea's edge, billowing clouds of roaring steam rising skyward at each high tide. ------Finally, about six million years ago, the eruptions ended. What caused this cataclysm? We think it was the result of that collision between our continental plate and the oceanic plate. Massive waves of subcrustal heat shoved the thin basaltic oceanic crust easterly against the thick mass of our siliceous continent. The heavy sea floor plate yielded and slid grudgingly beneath the lighter continental plate. Earthquakes shattered and shook the region. Inland, beneath the continent, the descending slab of ocean plate finally reached a depth where it melted. Heat bulged the fractured continent above and the molten remnants of the sea floor thrust upward, pouring out through the cracks and fissures. The rest, as they say, is history. ------The same battle, we think, caused the volcanoes of the Cascades. Rivers carried silica-rich sediments off the continent and onto the sea floor. These traveled on the moving sea floor and descended with it under the continental rim. The siliceous sediments melted. Silica-rich molten rock, in contrast with basalt, is sticky and viscous. The sticky lava forced its way upward through the continental crust. Eventually, near the surface where the weight of confining overhead rock was less, it blasted its way out as eruptive volcanoes. Symmetrical mountains of ash built high, glacier-draped cones. ------Periodically, a new mass of viscous lava forced its way toward the surface. 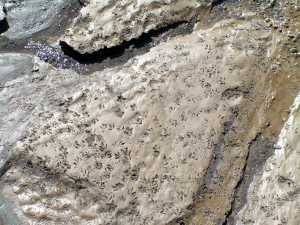 The sticky stuff clogged the volcanic vents beneath and within the volcanos. Pressure built below the plugged vents, until a massive explosion blasted rock and ash miles into the sky. Some of these Cascade eruptions were so incredible, that ash fell around the world. So much 'stuff' was blasted skyward that the land surface over a hundred square miles collapsed into the empty chamber creating a huge hole - a caldera - Crater Lake sits like a small puddle wiithin a huge caldera. ------The process continues today. Our lives are so short, relative to the history of the events we relate, that the geologic quiet we see around us belies the violence of living on a plate boundary. The sea floor continues to thrust under the continent. More than a thousand earthquakes are detected each year in Washington and Oregon - maybe ten are felt. Some of the fault zzones along the boundary are thought to be 'locked,' thus storing massive energy that could be released at any moment. Such a slippage could create a devastating earthquake that would shudder the land surface. They might generate huge seismic sea waves, tsunamis, that would drown the coastlines under hundreds or thousands of feet of succesive waves of sea water. There is a geologic timebomb ticking beneath the Northwest. 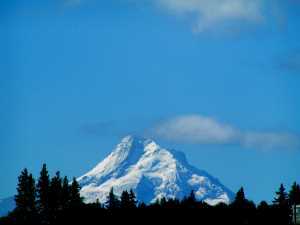 ------The Cascades are an active volcanic belt. Many remember the eruption of Mt. St. Helens. Mt. Ranier, Mt. Hood, Mt. Baker - all could spring back to volcanic activity. ------The question is not if, but when. An analogy might help: You are a microbe, and your lifespan is a nanosecond. Your life seems reasonably long, since you know nothing else. You live in a nice quiet environment - on a human chest - but in your brief lifetime, you feel no motion and have no worries. You are unaware of the living thing beneath your feet - of a heartbeat, a scratching finger - since you live between those events. Perhaps microbic legends, related by your grandmother, tell of disastrous events in the past. Probably all will be calm throughout your lifetime, but that human could sneeze or scratch at any time. The earth is dynamic, and most of us will live "between the heartbeats". Geologic 'legends' overcome the brevity of our lives and reveal tales of wonder and horror. ------Robert Frost, in his classic poem, Fire and Ice, concluded that "either will suffice." 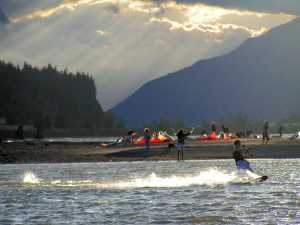 And so one might decide when cruising the Columbia and its tributaries. ------At least four times during the last million and a half years (an eyeblink in geologic time), frigid glacial periods engulfed the northern reaches of our continent with massive ice sheets. The southern areas of Canada and the northern US appeared as Antarctica does today - buried under miles of ice. During those glacial times, ice sheets would periodically advance and retreat. Each time, they melted into oblivion for hundreds of thousands of years before reappearing and swelling into continental glaciers again. Mountain summits far to the south of the ice sheets were crowned with Alpine Glaciers that flowed down their flanks, only to retreat or disappear during interglacial times. Four times! - During the last moments on the geologic clock! And it is likely that we are living in an interglacial and they will someday return again. ------Ice carved the Rocky Mountains, up at the headwaters of the Columbia River in British Columbia. The rugged terrain of Lake Revelstoke and the Arrow Lakes clearly shows the footprints of ice. Washington and Oregon, and most of the Columbia Basin, were just south of the ice sheets. The proximity to ice is, however, evident to geologic eyes. The weight of an ice sheet over a mile thick is incredible. Even rock yields to the grinding mass. The pulverized remnants of crushed, milled rock are deposited under and around the ice as mounds of sand, silt, and cobbles. Most of this debris was simply dumped by the ice, to be redistributed by water and wind. 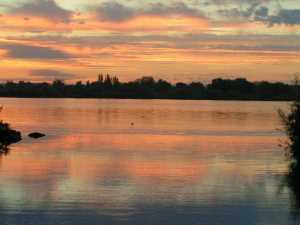 ----- The gentle hand of Aeolous, the God of the Winds, distributed some of the glacial outwash. The enormous contrast between the heat of summer and the frigid air of a glacial winter created tumultuous atmospheric conditions. Sweeping blasts of air crossed the landscape, lofting silt and sand into incredible sandstorms that smothered the land. 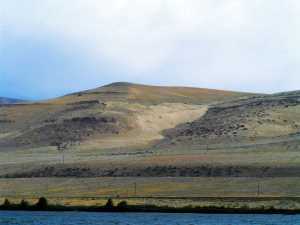 The Columbia Basin is blanketed with deposits of the wind-blown debris of glaciers - loess. In some areas, the loess is more than 200 feet thick. 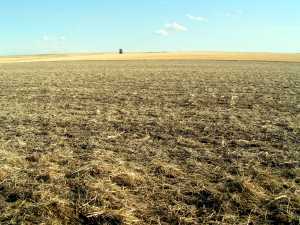 The loess-rich soils of southeastern Washington are ideal for growing grains, making this region one of the world's major wheat-growing regions. Today, strong winds still lift loess from farmers fields into sandstorms. ------Water, however, did most of the job. Sediment-laden meltwater poured through and off the Ice Sheets every summer, and the Ancestral Columbia River was there to catch and carry the debris across the Northwest to the sea. This was not an easy route, however, since a tongue of ice blocked the Columbia near present-day Grand Coulee dam and made an ice dam 3,000 feet thick. Glacial Lake Columbia, thousands of feet deep, backed up as far as Idaho. Much of the glacial debris settled to the bottom of the lake water. The natural spillway formed a large canyon, the Grand Coulee, complete with huge waterfalls at its head. ------Of even greater significance was the lobe of ice that dammed the Clark Fork River near the Idaho-Montana border. This ice dam formed a glacial lake, Lake Missoula. The lake was 2,000 feet deep at the dam and held the volume of today's Lake Michigan. The lake had no spillway. It kept filling until the dammed water floated the ice dam, instantly shattering it. Within a few days, the lake drained, creating the largest and most catastrophic flood ever detected by geologists. The flood released more than ten times the combined flow of all the rivers of the world. A wall of water hundreds of feet high raced down the Spokane and Columbia Valleys faster than 50 mph. The shock wave from the approaching wall of water deafened any doomed animal in its path. 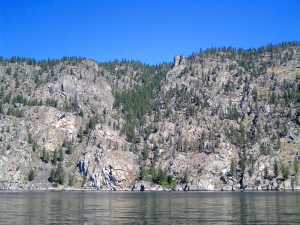 The huge flood carved and moulded the topography, scouring coulees and isolating buttes. Racing over the land, it created huge water falls, now dry, and giant ripple marks. Then, receding, it plastered the landscape with sediment. This scenario happened not once, but at least seventy times, over a period of 2,600 years. The last flood was just over 12,000 years ago. The result is a remarkable region, scoured by incredible floods - the Channeled Scablands. ------This is a landscape buried by huge sheets of red-hot lava, inundated by mega-floods, and quivering from plate collision. A massive earthquake, huge tsunami, or devastating volcanic eruption could occur at any moment. This is truly an exciting place to live or visit.